Unconditional Surrender is a mixed-media work incorporating computer-generated images and hyper bursts of extreme light. Five projections create a continuous 360-degree view of dark abstract space on a circular wall measuring approx. 26.5 ft. in diameter and 9 ft. high. 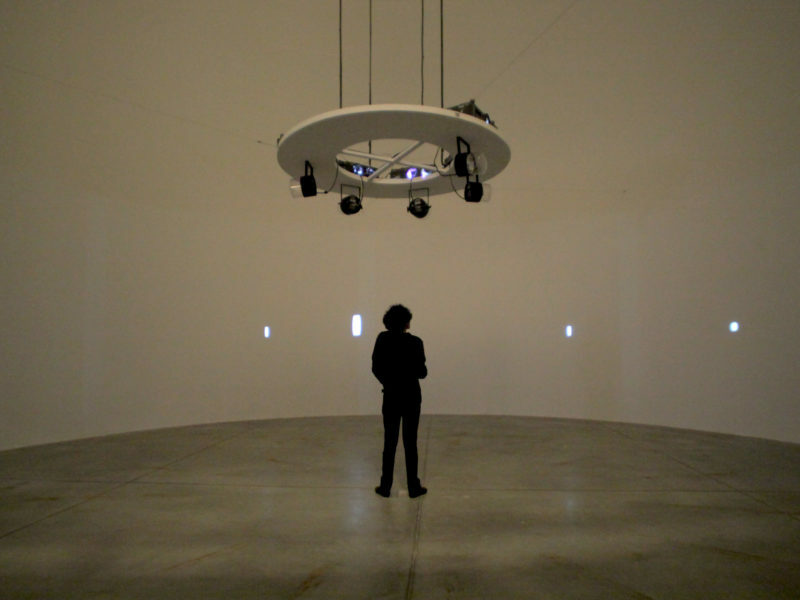 Mounted on top of the circular wall is an aluminum suspension system on which the five projectors and strobe lights are mounted, consisting of a central pentagonal plate with five spokes of aluminum channel radiating to the perimeter of the circle. The entire structure is reminiscent of a wheel in which the viewer enters. 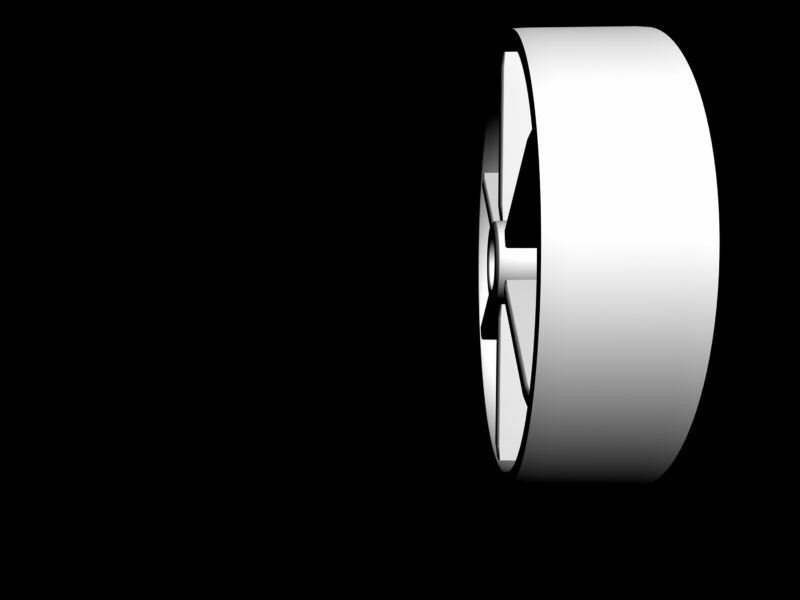 Perhaps from an imaginary horizon, projected points of light slowly emerge, enlarge, and come into focus as heavy “steel” wheels, rolling towards the viewer with a sense of slow inevitability. 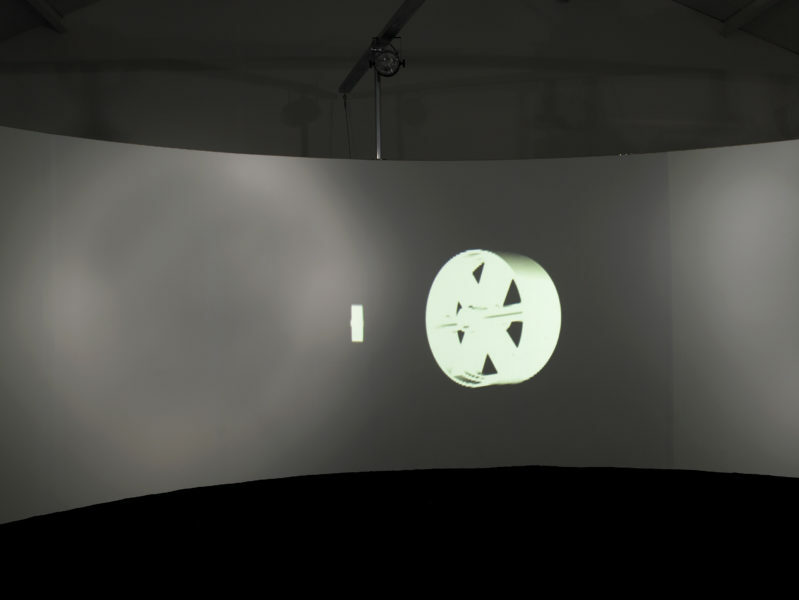 As the wheel(s) pass “through” the viewer, a momentary burst of extreme light fills the eye, space, and presence, merging a virtual mindscape with an instance of physicality. “Gary Hill / It’s Turtles All the Way Down,” in SITU / Fabienne Leclerc, Paris, France, October 25 – December 13, 2008. Gary Hill:o lugar sem o tempo / taking time from place. Rio de Janeiro: Contra Capa Livraria / Mag Mais, 2009, p. 97 (photo).